Green Energy Store Ltd are one of Ireland's most experienced installers of solar PV panels. Our preferred solar PV panel manufacturer is Sharp. Sharp was founded nearly a century ago in Japan and has been at the forefront of solar technology for the past fifty years. The vision of their founder, Tokuji Hayakawa was that "Sharp makes products that others want to imitate." With so much experience behind them, it's no wonder Sharp produces such high quality solar panels. Sharp's solar PV panels are built to withstand the most rigorous operating conditions while still offering high power output. Their proprietary innovation in surface texturing of panels increases their light absorption, yielding high efficiency ratings. Sharp solar PV panels offer a 10 year product warranty at 90% output and 25 year power output warranty at 80% and are backed by Sharp's long standing reputation. Their panels offer the highest standards in safety, durability, wind loading and ease of assembly. 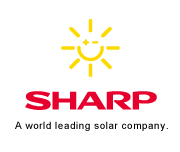 The solar cells and modules manufactured by Sharp deliver a total output of over 4 GWp, making Sharp one of the world’s leading manufacturers of premium quality modules. 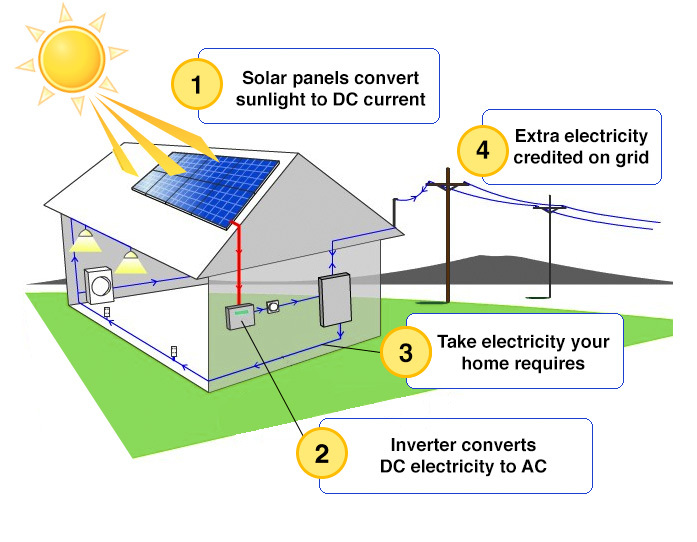 The inverter is an electronic device that converts the DC electricity produced by the solar array into AC, with the same voltage and frequency as the mains supply. The inverter also performs various safety functions, constantly monitoring the grid and switching off in the event of a fault or major fluctuation in mains supply. The output of the inverter goes directly into the building’s fuse box – feeding solar electricity into the building’s conventional electricity supply, meaning you will not have to buy so much electricity from your electricity supplier. The efficiency of the panel. The overall size of the PV array. Which direction the panels face. The angle at which the panels are mounted. The amount of shade that may cover the panels. Does Solar PV work in Ireland? There is an opinion out there that Solar technology would not work in Ireland. This stems from people thinking that we don’t get enough sunlight in the summer, never mind the winter. This however is not true, photovoltaic cells work on sunlight as opposed to the heat from the sun. In fact, Ireland has the same annual Irradiation levels as many parts of central europe, ranging from 1200 kWhr/m2/yr in the south of the country to 1000 kWhr/m2/yr in the north of the country, a good average for the entire country is 1100 kWhr/m2/yr. If you consider our typical winters would not be as bad as many parts of central europe, our mild climate is ideal for solar installations, as we never get too hot or too cold and we have good light levels for a large part of the year. Solid company with reliable quality: A solar energy system is a long-term investment. In order to be satisfied with your decision for a long time, you should be able to rely on the quality. Sharp’s 100 year history and more than 55 years of experience in solar technology give you confidence for your investment. Performance: Pmax is the power of each solar module. It is stated in Wp (watt peak) and refers to the output from the solar module electrical peak power under standard test conditions. Sharp offers different modules of 250 Wp to 300 Wp. Efficiency: The efficiency is the ratio of input (sun energy) to output (solar power). Normally, the module efficiency is compared. However, some manufacturers also specify the cell efficiency. For this reason, you should make sure to compare the correct values to each other. A higher performance and greater efficiency are especially recommended when space on the roof is limited. Sharp solar modules achieve a very high efficiency of up to 19.8%. Guarantees: Solar manufacturers specify two different guarantees: the products guarantee and the performance guarantee. The output of a solar module normally decreases during runtime. The maximum reduction is regulated by the performance guarantee. Sharp offers a 10 year warranty on the product and a 25 year linear performance warranty. Some manufacturers specify a staggered performance warranty. With Sharp’s linear performance guarantee, you have good planning security for your solar system. Financial stability: Bloomberg New Energy Finance (BNEF) has established a rating system for the classification of solar module manufacturers. Companies for which the bankability is evaluated as being positive are classified as first-class manufacturers. Sharp Electronics was included in the list of Tier 1 solar companies in May 2015 and thus stands for financial stability. This in turn is an important indication of the warranty compliance.